Winter can be a wonderful time of year, from beautiful snow-covered land to all the holiday cheer. But here at Soy of Life we know it can be another story when it comes to your skin, as winter usually means dry, itchy and cracked skin from head to toe. But what causes skin to get dry in the winter anyway? When the weather is humid, that means there is more water vapor in the air, and moist air helps keep our skin moist. During the winter months when temperatures drop and humidity levels decline, our skin’s hydration levels also decline, which causes dry skin. Even the heated air in homes and offices tends to be on the drier side, and this constant exposure to dry conditions causes skin to thicken and crack. Proper skincare is important all year round, but choosing the right products is particularly important during the winter months. 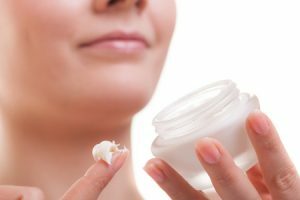 Many products, especially those designed to help treat acne, contain drying agents like benzoyl peroxide, and the last thing you need during the winter is to use a product that will dry out your skin. During winter be sure to use heavy emollients like our Pure Hand and Body Butter which we sell specially during the fall and winter months. If you’re already noticing drying and/or cracking in your skin, try our Healing Balm for intensive repair. For more of our all-natural, soy-based skincare products, shop our online store or contact us today!